THE CRITICS HAVE SPOKEN . . .
“If I had to pick five words to describe this book, they’d be: educational, entertaining, cautionary, tragic and beautiful. “Clearly written, factual, informative, and giving me a new regard for some of the items around me. RATED 5 Stars by Amazon!! LIMITED NUMBER OF FIRST EDITION COPIES REMAINING! 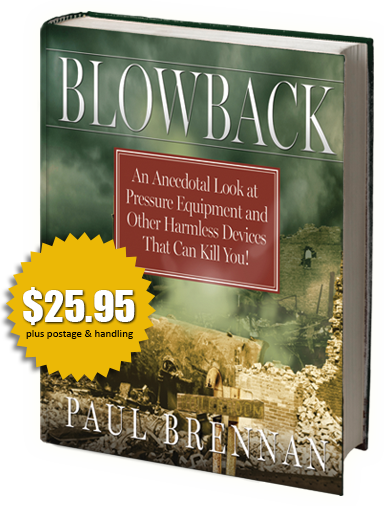 Through compelling short stories, essays, illustrations, and rare photos, BLOWBACK details the dangers that exist when pressure equipment is misused, neglected, or defective. Citing examples as far back as 2,000 years ago up to modern times, BLOWBACK reminds everyone of their close proximity to potentially hazardous pressure equipment several times each day.